Posted on October 22, 2018 at 11:47 pm. Nov 9th & 10th: 46th Annual Arts & Crafts Faire at Christ Episcopal Chruch. 35350 E. Division Road, St. Helens, 9-4 PM. Unique handcrafted items: jewelry, windchimes, quilted, embroidered and sen items, soaps, ornaments, knitted 7 crochet items, cards and paper crafts, pottery, art prints, sculpture and free children’s activity table. Favorite Raffle “Holiday Basket” and more. Get a bowl of soup or chili & don’t forget to browse bake table so many homemade goods! Nov 10th: Rainier Church of God Bazaar 10 – 4 PM. Hot cinnamon rolls for sale as well as many vendors. Fall Harvest Festival, St.Helens Recreation Program, The City of St. Helens and St. Helens School District have partnered to bring a Recreation Program to St. Helens. They are hosting their first Fall Harvest Festival between 9-4 PM with over 40 vendors at 1810 Old Portland Road, St Helens, OR. Elks Bazaar put on by the Ladies of the Elks at 350 Belton Road, St. Helens, OR. Open to the public between 9-3 PM. 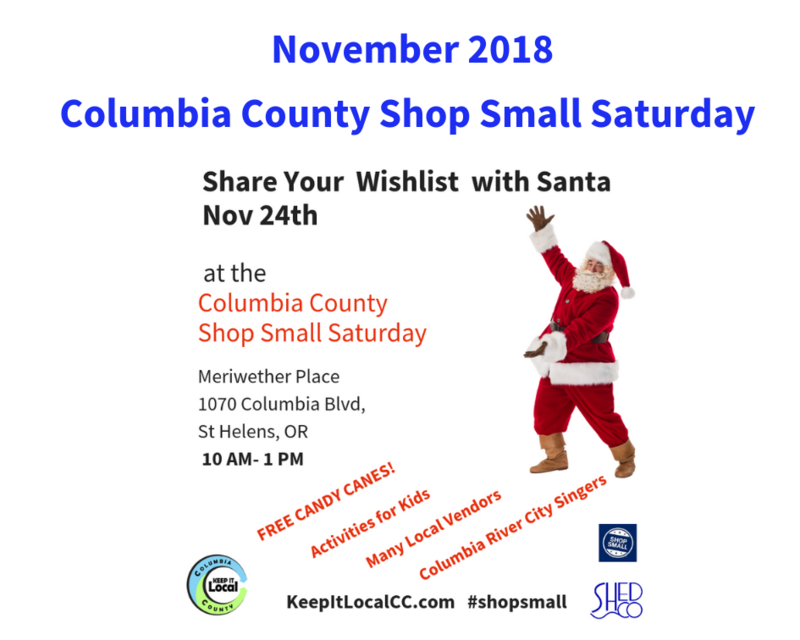 November 24th: Columbia County Shop Small Saturday at Meriwether Place, 1070 Columbia Blvd, St.Helens, OR 9:00 AM – 2 PM. Local businesses and many artists from across Columbia County. Santa will be on site between 10-1 PM. Take your own pictures donations welcome. Entertainment by Columbia River City Singers, Vernonia Dickens Carolers, & the St Helens Public Library Ukulele. Door prizes, Free Hot Chocolate Station & treats while they last. Shop Local Bags given to all attendees while supplies last. Bring your Letters to Santa. St Helens Christmas Bazaar Over 45 vendors to help you find perfect Christmas gifts! Lunch will be served from 11 -1 PM and includes popular items from last year such as cabbage rolls and potato soup. Santa will also be on site. Be sure to bring your kids and camera! 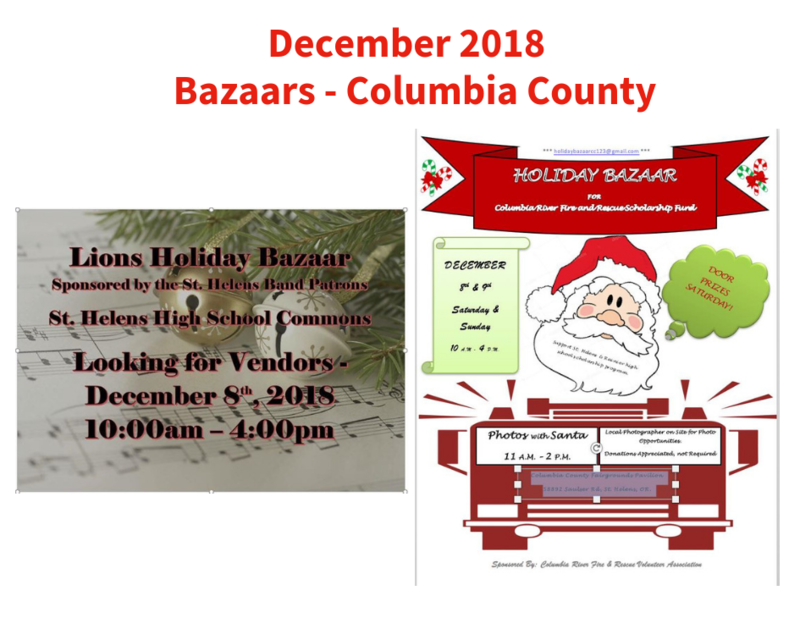 The St. Helens Moose Lodge Annual Holiday Bazaar December 1, 2018 – 10 a.m. to 3 p.m.
Holiday Bazaar for Columbia River Fire and Rescue Scholarship Fund, 10-4 PM at Columbia County Fairgrounds Pavillion, 58892 Suaslser Road. Door Prizes on Saturday. Event held December 9th as well. Posted on August 13, 2018 at 4:41 pm. Goble, OR – Goble Warming is an annual tradition that happens on the third Saturday in August in Goble, OR otherwise knows as “Where The Hell is Goble.” The Historic Goble Tavern, 70255 US 30, Rainier, OR, voted “Best Small Town Bar in Oregon” hosts a yearly event callled Goble Warming that also raises money for a local nonprofit. This year they will be raising money for CASA for Children of Columbia County. GOBLE WARMING is a three day event of fun for friends and family starting Friday night August 17th thru Sunday 19th with a focus on live music. This is a kid friendly establishment until 7 PM each night with extended hours to 9:00 on Saturday so bring your whole family. You can also shop on site with vendors and a flea market both Saturday & Sunday. Friday night Karaoke kicks off the fun at the backyard stage at 7:00 PM. Saturday includes a barbeque and live bands all day such as James Harlow, Guy Live & the Goble All Stars. At 5 PM Saturday Night 18th, the Horn Dawgs take stage. They are a returning band from Scappoose, OR featuring killer horns. They are rhythm and blues with touches of classic rock make up the repertoire of the Horn Dawgs. Sunday starts with a Bloody Mary Bar & Breakfast then Battle of the bands at 11:00 AM with an Open Microphone. A car show to entince the car enthusists happens as well on Sunday. Posted on July 18, 2018 at 10:02 pm. Posted on July 16, 2018 at 7:35 pm. 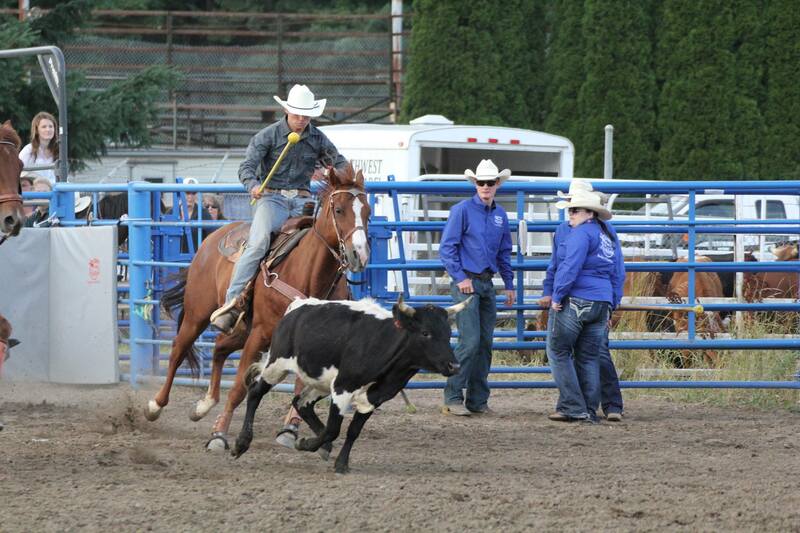 Columbia County, OR – Columbia County Fair & Rodeo is an annual tradition here in Columbia County. 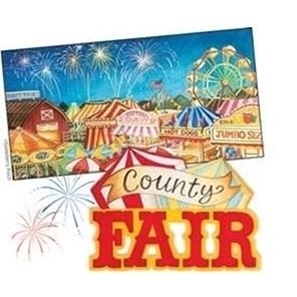 This year marks the 103rd year for the Columbia County Fair & Rodeo. Attending the fair provides you and your family with many opportunities for fun and a chance to see your neighbors. You will be able to experience the Warren Grange Farm Museum, Master Gardeners Gardens, carnival rides and food, Open Exhibits that include art, canning, baked goods, floral arrangements and more, 4-H Animals demonstrations and the Youth Livestock Auction, local vendors, a plant sale, free family-friendly entertainment, a beer garden for 21 & Older, and so much more. 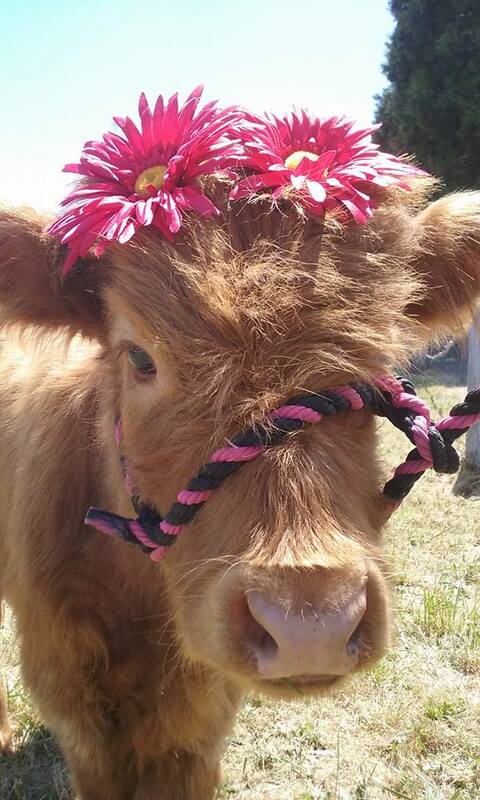 The Columbia County Fair & Rodeo has plenty of events to fascinate everyone in your family. Wednesday 18th invites Seniors/Veterans to attend for FREE. RSVP (Retired Senior Volunteer Program) is hosting a luncheon to recognize senior volunteers followed by My Fair Lady Padget at 1:00 Pm. Stay around to enjoy live music by local band The Decades from 5:00 PM-7:00 PM. You can entertain kids by learning about parrot species in a fun-filled, and entertaining pirate-themed show at The Pirates Parrot Show! Jeff Evans makes events fun and unforgettable with his interactive magic. View detailed schedule online. Thursday 19th is Junior Rodeo/Kids Day this means free fair entrance until 3:00 PM. Hit Machine, a local favorite band, performs from 3:00-6:00 PM. Jeff Evans makes events fun and unforgettable with his interactive magic. Buck Trout drives around in his little truck, his zany antics and comical stories always make a lasting impression that brings smiles and laughter to children of all ages! 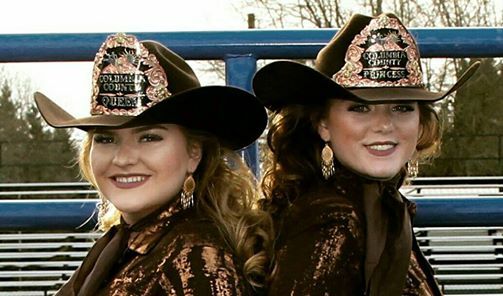 Plus, a pie eating contest at 2:00 PM stick around to see The Junior Rodeo which starts at 6:00 PM. 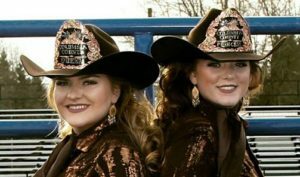 Friday & Saturday – Kick off your weekend with the National Professional Rodeo Association (NPRA) Rodeo Friday & Saturday night. Live music includes Brewers Grade delivers a set list that is always fresh, built around the latest Country material as well as covers for classic and outlaw country and country sensation, Showdown. Saturday & Sunday – Straight Up Racing’s Monster Truck show Saturday & Sunday at this years Columbia County Fair & Rodeo! Go on a ride in a monster truck before the show starts!! Admission is $20 for adult, $15 Senior/Veterans & Kids 7-17, 6 & under are free! Fair is done at 5:00 PM. 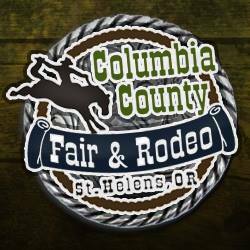 To stay up to date, please follow the Columbia County Fair & Rodeo Facebook page and get your tickets ahead of time on their website. You can get more information about specifics from the Columbia County Fair & Rodeo: 4-H Exhibit Information, Open Exhibits, and Columbia County Youth Livestock. Posted on June 22, 2018 at 12:41 am. 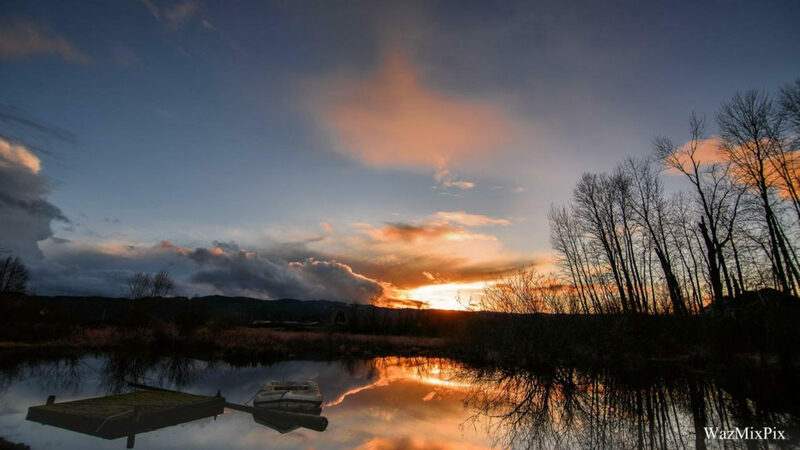 Columbia County, OR – Living in a small town provides the opportunity to know your neighbors. Communities across Columbia County have local traditions each community has a different way they participate in celebrating July 4th. 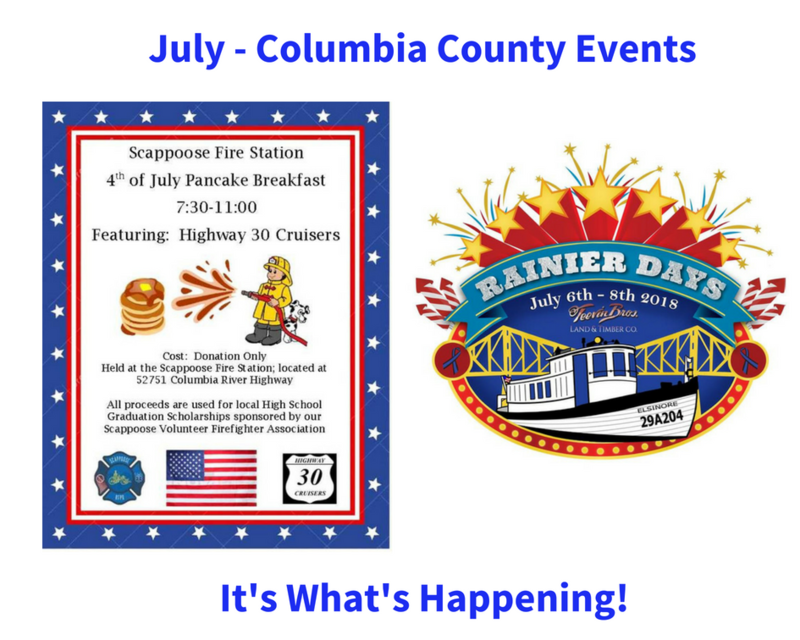 We suggest you start off your morning with a Pancake Breakfast in Scappoose from 7:30 -11:00 AM brought to you by the Scappoose Fire Department, Scappoose Volunteer Firefighters & Highway 30 Cruisers. The kids will love eating pancakes at the Fire Station. Plus, it’s a way to meet your local community responders who are raising money for graduation scholarships. Clatskanie has Heritage Days with a Car Show starting on June 30th so if you are a car enthusiast this is the place for you to be. This year the committee has added quite a few new events such as a softball Game for Rainier Vs. Clatskanie, a Mustache & Beard Contest to mention a few. Heritage Days on the 4th of July is complete with fireworks to end the evening. For a full list of events visit the Clatskanie Heritage Days Facebook Page. St Helens will have live music, vendors, tailgating opportunities down at the waterfront ending the evening with fireworks. You can follow their website to stay up to date. Vernonia is hosting The Great American Bash complete with an evening parade and fireworks hosted by Intercultural Society of Vernonia. The parade starts at 5:00 PM with a ticketed concert to follow at Hawkins Park. Jessie Cain LIVE in Concert Nashville’s latest up and coming country music singer/songwriter, along with the Hill Road Band, both right from Vernonia’s backwoods will perform a concert you won’t want to miss. Get your tickets at Eventbrite. Fireworks will follow the concert. Rainier hosts Rainier Days in the Park July 6th-8th. They have a weekend celebration with live music, rides, vendors and the fireworks. To wet your whistle on a few of the highlights that include a variety of interests to match everyone’s taste such as a Wrestling Match with AC/DC Tribute band on Friday night, Totally Awesome 80’s with Music by Live B on Saturday afternoon, Sanctus Real on Sunday at 5:00 PM. 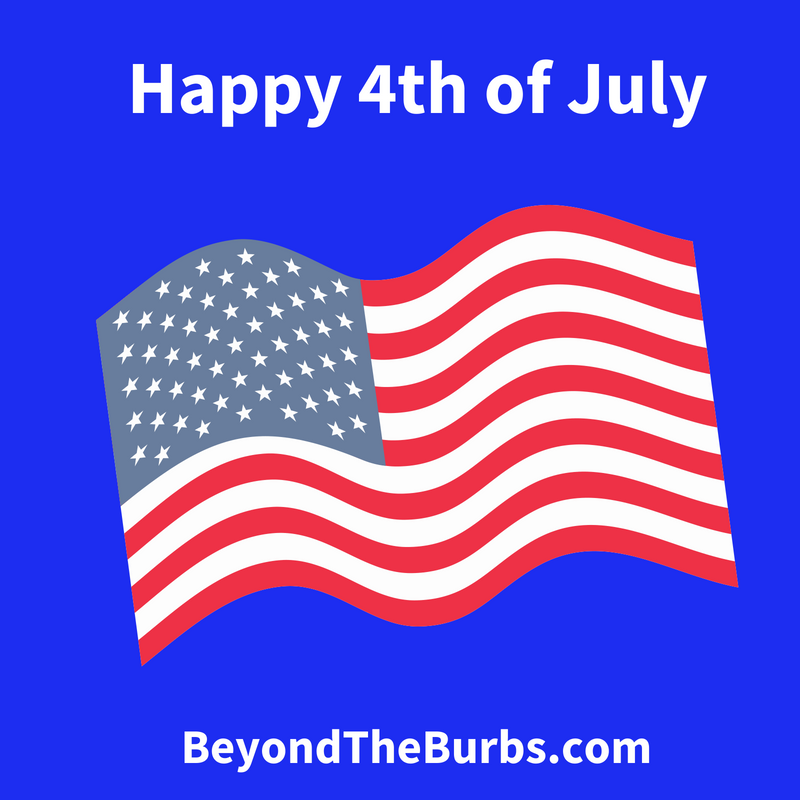 No matter what you do or where you go, we wish you a great 4th of July from all of us at BeyondTheBurbs! Posted on May 31, 2018 at 6:06 pm. Columbia County- The 3rd Saturday in June is a day filled with family fun activities around Columbia County. The Kiwanis Parade in St Helens happens every year at noon on the 3rd Saturday. 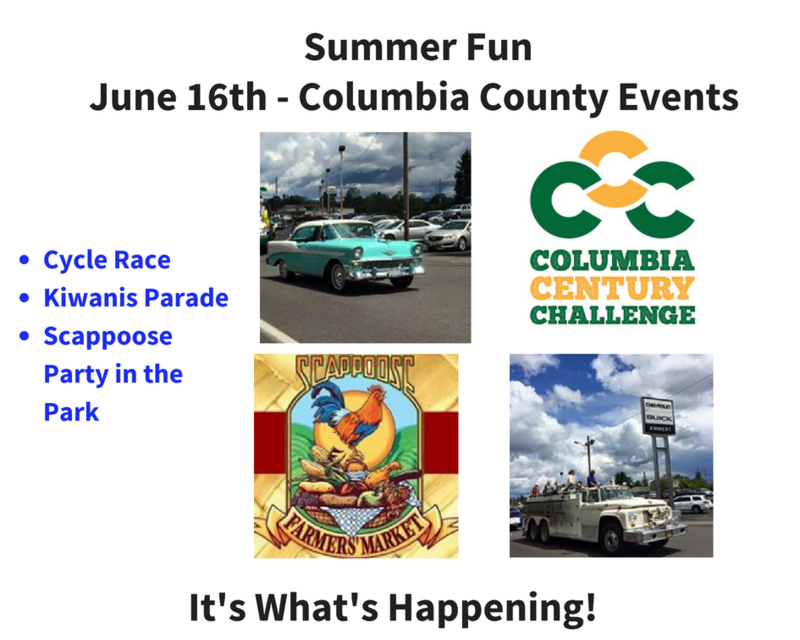 This year a few other local events such as the Cycle Columbia Challenge starting and ending in Scappoose and Scappoose Party in the Park with live music and extended Scappoose Farmers Market hours also happens the same day. It’s a day full of community fun right in your backyard a little something for everyone. The Kiwanis Parade is a yearly tradition. This year’s theme is “Honoring Those That Serve.” Spectators can set up a prime spot anywhere along the streets of Columbia Blvd. The standard parade route starts at the corner of Hwy 30 & Emmert Motors and continues down to to the Dockside restaurant. It starts at 12:00 and typically lasts about an hour or longer depending on the number of entrants. This is a FREE parade to enter to showcase your business or community. If you want to participate in the parade or want more details, follow the Facebook Event. Parades are a fun way to meet your neighbors and celebrate small-town life. You can also tune into KOHI 1600 AM or stream from App Tune IN to listen to the parade as our local radio station broadcasts live from the event. If you are a cyclist, you can join in the 3rd Annual Cycle Century Challenge. This is the only cycling event in Columbia County. It has two different routes a Century Plus and a Metric Century Plus with scenic views of farmland, timberlands, on unpaved historic CZ Trail, and charming small towns. Plus all the Cyclists are invited to the Scappoose Party in the Park after the race. You can sign up in advance or register the day of the event. It starts early at 6:00 AM. Go to www.cyclecolumbiacounty.com for more details or to register. Why not end the day with a community party? This year Scappoose Party in the Park starts with extended Scappoose Farmers’ Market hours and live music Hit Machine Unplugged will perform a kid-friendly performance from 4-6 PM. Posted on May 1, 2018 at 7:35 pm. St. Helens, OR – Book Signing, Open Mic, Fiber Art & Leather Making Demos, all ages Coloring Contest and more fun. What do all of these have in common? 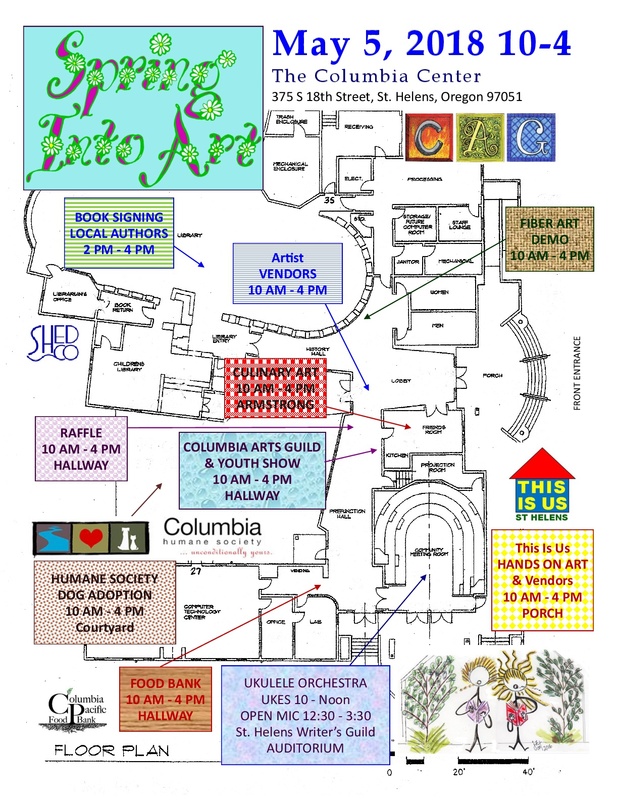 It’s the 3rd Annual Spring Into Art event at The Columbia Learning Center, 375 18th Street St. Helens hosted by the Columbia Arts Guild (CAG) on May 5th from 10 AM- 4 PM. This is a free family-friendly fun community event. New this year, sponsors donated prizes for the coloring contest and raffles! Events like this couldn’t happen with support from local businesses like St. Helens Market Fresh (Red Apple), Walmart, Safeway, Ace Hardware and Lagunitas Brewing Company. You still have time to participate in Coloring Contest. Entries taken until noon on May 4th, Drop off at the Columbia Learning Center. You can go to this link for contest rules and pages. Be sure to click on right click on the image, save as and print out to color to participate. Other partners on site will be This Is Us St. Helens, a community art project, St Helens Ukelele Orchestra, Sausage King food cart with food available for purchase and of course the art show and vendors! The Columbia Humane Society will be on site and if possible please bring a non-perishable food item to donate to the Columbia Pacific Food Bank. Local events like these give you a chance to meet your neighbor, learn something new or just have fun. See you on Saturday! Posted on January 31, 2018 at 10:35 pm. Scappoose, OR – The new business that has everyone buzzing comes complete with a water feature as one would imagine from its name, The Lake House. 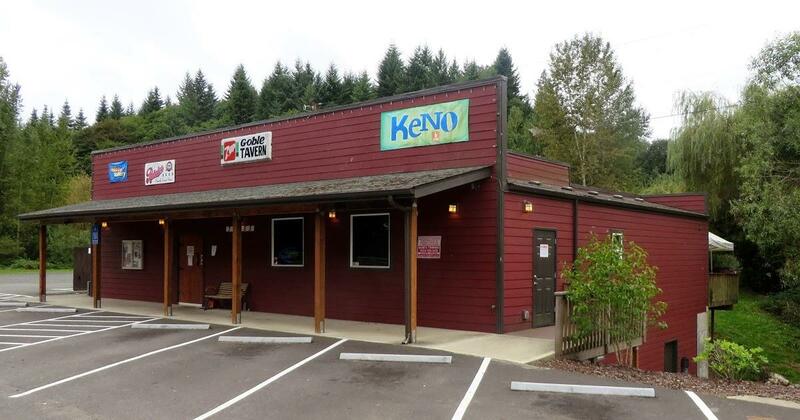 It is located at 1600 SE 9th St. in Scappoose, OR. They opened their doors to events after hosting their first wedding in August of 2017. Since then they’ve hosted many types of events such as baby showers, class reunions, weddings, birthday parties, memorials, family reunions, holiday events, and much more. They have a blast at everything they do with the main goal to make their client’s vision come to life. It’s not surprising that this new event, performance & concert venue is such a success from the start. Bart Hafeman, the owner, decided to open the doors to events because of his years of experience in the industry and his desire to create a warm, positive atmosphere for celebrating unique moments and milestones in life. If you’ve seen Bart play, he carries that rock n roll, have fun just dance attitude always with a big smile. He makes you want to get up and go. His positive outlook on life carries thru in his interactions with his audience and clients. 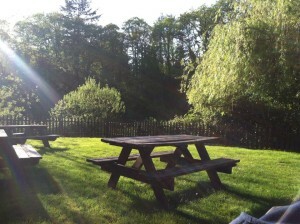 Bart’s experience gives The Lake House its own relaxed atmosphere that draws people to his venue. Bart Hafeman is widely known as the singer for Hit Machine, and because of that he’s been able to entertain at a handful of our events- However, they have hosted small private exclusive events like Jennifer Batten, guitar player for Michael Jackson on the Bad, History and Dangerous world tours. Bart joined in and sang “Human Nature” with her that evening. Tommy Tutone who sang the 80’s hit, “867-5309” has performed on the property as well. They are currently working on a Lake House Summer Concert Series and would love to hear from people about who they would like to see perform at The Lake House. Please send your suggestions to ashley.gray28@yahoo.com. They want to hear from you! If you are looking for a venue to host an event, you may want to consider The Lake House. They can accommodate between 20 to 200 people. 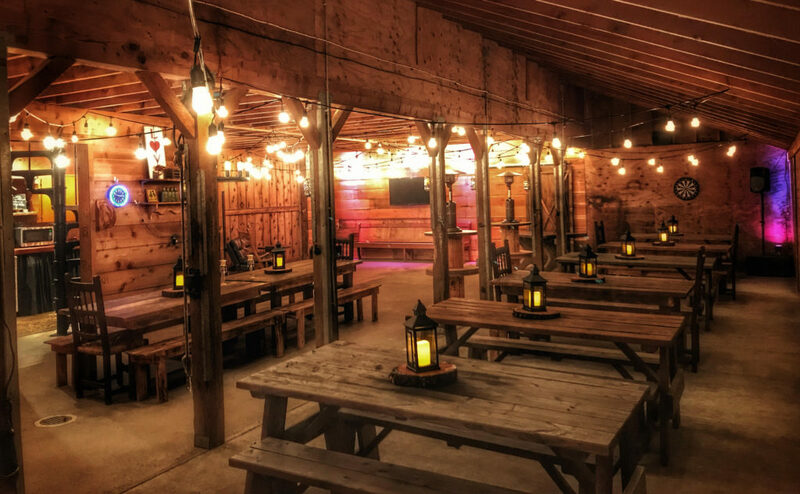 For winter events the barn can hold up to 85 individuals downstairs and 30 people upstairs- summer events offer more room due to better weather conditions, which allows up to 200 guests. Additionally, they offer a complete package for the one-stop shopper, or can customize an event when desired. They have a list of preferred vendors but are always open to our client’s dreams and desires for their event. The Lake House offers an incredibly unique atmosphere that carries a rustic and elegant element all at the same time. The barn has a warm intimate feeling that not many venues offer. Classic Cars, Antique Airplanes & More! Posted on August 8, 2017 at 12:04 am. Columbia County, OR – Columbia County has an active car club. Have you heard of the Highway 30 Cruisers, a nonprofit with approximately 30 members and growing? This car club stays busy, especially in the Summer. Members invite you out to view their cars for some fun, a trip down memory lane sharing history with loved ones or maybe you own a car? So many ways to get involved at all ages. In case you missed it, it’s not too late. 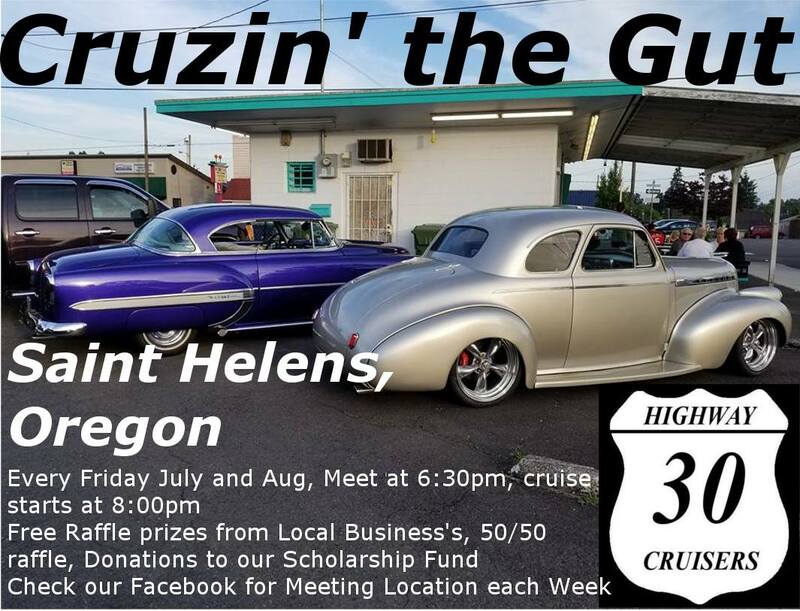 Every Friday night in St Helens July-August this group holds an event called Cruzin The Gut. Still, three weeks to go held on August 11th, 19th & 25th. The club members meet at a different business at 6:30 pm, raffle at 8:30 pm with prizes from local businesses and 50/50 raffle with donations towards their Scholarship Fund. The cars cruise until they want to go home. This is a great family friendly event to take the kids to see the cars or a great date night. Follow their Facebook page to keep up to date on the Cruzin The Gut. 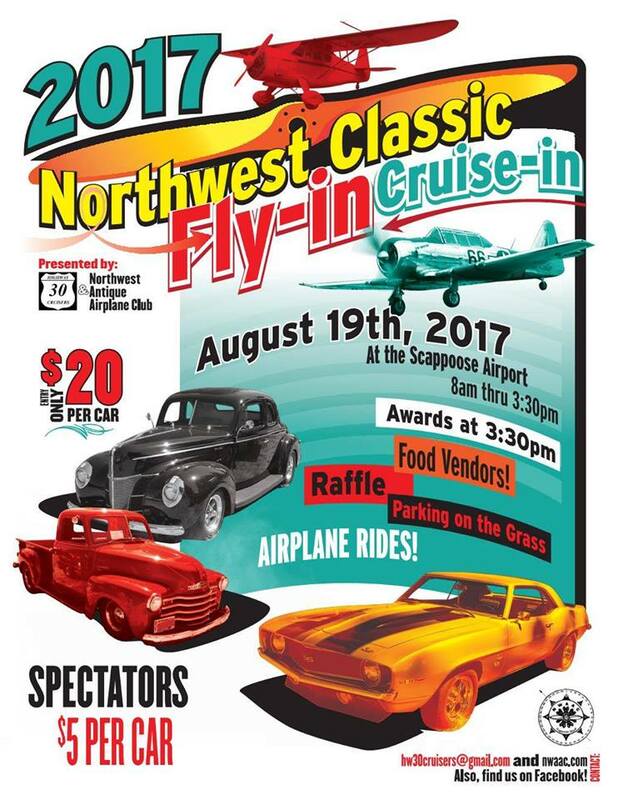 Highway 30 Cruisers also co-hosts an annual fundraiser with the Northwest Antique Airplane Club to put on the Northwest Classic Fly-In, Cruise- In at the Scappoose Airpark on August 19th, 2017. Both organizations are non-profits and raise funds for local scholarships. The event starts early at 8:00 AM and goes until 3:00 PM. Live music will fill the air and if you’re feeling adventurous, you can also get an airplane ride. You can enter your car to be judged or park your car on the grass. It’s $20.00 to enter your car or $5 for being a spectator. Posted on July 14, 2017 at 7:45 pm. 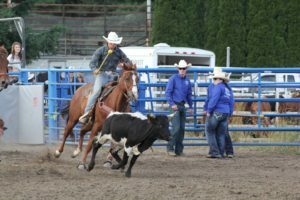 Columbia County, OR – Columbia County Fair & Rodeo is one of the oldest annual traditions in Columbia County along with the Kiwanis Parade. It’s four days of nothing but fun after a year of hard work by local citizens who donate their time to put on one of the best Fair & Rodeos around. You’ll find many different entertainments during Fair Week it’s highly recommended you check it out as it has something for all ages. As tradition dictates, the opening ceremony starts at noon on Wednesday the 19th. It’s also Senior and Veterans Day that means free admission for both Seniors and Veterans. 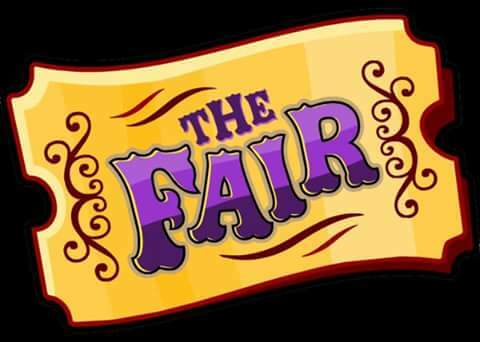 Our fair seems to have something for everyone such as live music, carnival rides, exhibits, entertainment, Amateur & Professional Rodeo, local vendors, fair food, Elks Beer Garden, Dairy Princess Ice Cream Booth has the best milkshakes, Bingo at the Grange Booth and so much more. Adults and kids alike enjoy seeing the open 4-H exhibits such as local photography, baked goods, flower arrangements and livestock with chickens, goats, pigs, cows, and horses. It’s nice to see a showcase of our rural county represented at our fair. Additional acts such as Pirate Parrot Show, Jerry Harris Master Hypnotist, Cooks Racing Pigs, Jeff Evans Magician schedules can be found on the Fair Event Schedule. Don’t forget to check out the Farm Museum and the Master Gardners Gardens on site. Be prepared to bring some cash to the fair. It’s a low entrance fee at the gate. Ages 7-60 years old it’s $8.00. Seniors & Veterans and older $5.00 except Wednesday it’s FREE. It’s also $5.00 to park as a local Kiwanis fundraiser. You can also take the CC Rider out to the Fairgrounds scheduled is posted on their Facebook page. If the kids want to ride the carnival rides, make sure to get the pre-sale Carnival bands to save a few bucks. The can be purchased at the following local businesses: Chubb’s, all Wauna Federal Credit Union & St Helens Community Credit Union branches but for a limited time. To stay up to date on all things Fair & Rodeo, follow along on their Facebook Page. We’ll see you at the Columbia County Fair & Rodeo!